As we age it may become increasingly difficult to do the things we have always done, one of the first things that becomes difficult is house cleaning. 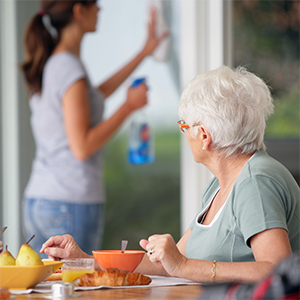 Although difficult to maintain for a lot of seniors, a clean and tidy house is necessary for physical and mental health and well-being. A tidy home is also critical for safety; preventing trips and falls from unnecessary things on the floor. At Retire-At-Home Services, we understand that your home is an extension of yourself, and the way you want it cleaned and maintained is unique. With us, you have the opportunity to determine how things should be done. During our initial in-home assessment, we will make a detailed checklist of everything that you want taken care of, and how you want it to be done. At any time after the services begins, you can request changes and updates. Making well-rounded nutritious meals can sometimes feel like a burden for seniors, especially those who are living alone and not cooking for others. Sharing a meal or having companionship while eating can brighten someone’s day and give a senior something to look forward to.